See a list of all Original Little People Parts, Pieces, and Figures sold in the sets. Description: With the exception of the 4 Little People Sesame Street sets, 1990 was the first time in Little People history that Fisher-Price introduced a licensed Little People set with a non-generic base and theme (House, Farm, Garage). In late 1970's Playskool had a tremendous advantage over Fisher-Price with their square-figure Familiar Places McDonald's® set and Holiday Inn set...their McDonald's® set was the first playset in history to sell over a million units in the first year. Likewise, Hasbro introduced the very popular Weeble licensed sets, including Winni The Pooh, and Disney. The only retort the Fisher-Price offered was 4 Sesame Street sets in the late 1970's, none of which were sold on the market for very long. Nevertheless at the very end of the Original Little People line, they finally did it! 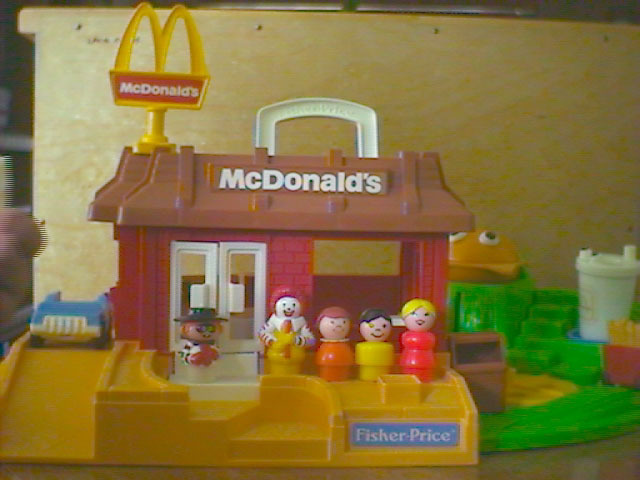 The sad part is to compare the Fisher-Price McDonald's® set to the Playskool McDonald's® set...by 1990 all of the Fisher-Price bases were made out of big chunkly-looking plastic that older children find too "baby-looking" to play with, thus causing Fisher-Price to loose a large range of customers. 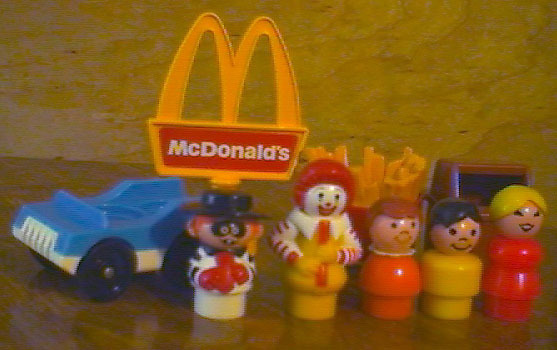 When the Original Little People were discontinued and replaced in 1991 with the Chunky Little People, the McDonald's base was modified to accommodate the Chunky figures. Even then, the Chunky McDonald's set lasted for only 2 years, and as of the year 2000, Fisher-Price never introduced another licensed product set. The most likable thing about the McDonald's set is that the building itself looks like a real McDonald's® restaurant with red brick-simulated walls and a brown roof. The base has a separate pull-out playground with a "gobbling" cheeseburger slide and a milk shake "shaker". When the McDonald's base is placed beside the #2550 Little People School, it is obvious where the inspiration for the McDonald's base came from. 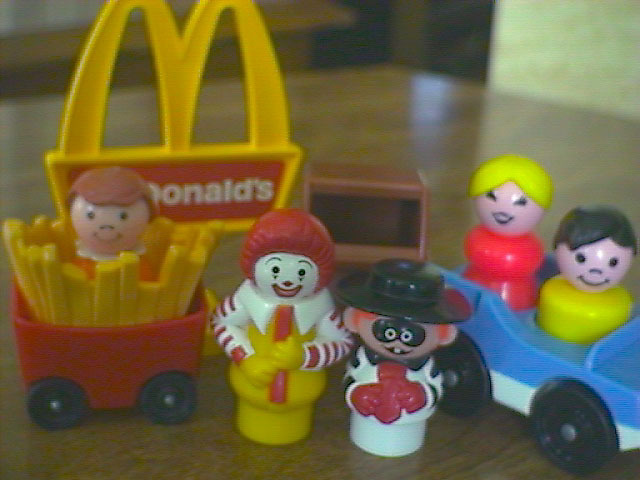 Where the base lacks creativity, the set makes up for in it's accessories, including a Ronald McDonald figure, a Hamburgler figure, and a cute little "fry cart" on wheels. These figures and fry cart are far more collectable and desirable among collectors than the rest of the set put together. B2552A - Red brick-simulated McDonald's® Restaurant building with a brown roof and large tan base. The roof has a white hinged carry handle on top. The base has a molded-in drive-thru ramp on the left side with a blue pull-handle on the side of base that opens the 2 white drive-thru windows on the McDonald's® building. The front of the base has 2 rounded brick-simulated steps that lead to the 2 white restaurant front doors. Depress the white food pad in front of the doors to make the doors open automatically. This base was sold with a separate green "PLAYGROUND" area with burger and shake rides. The playground slides under the restaurant base. Overall size: 12-3/4" square x 7-3/8" tall. B2552B - Green plastic pull-out playground that slides under the B2552A McDonald's® Restaurant base. The playground base has a molded-in track for the fry cart (separate part) with molded-in steps leading to the top of the track. The center of the playground base has a yellow spinning merry-go-round with 4 small round seat holes for Original Little People figures to fit into. The base also has a "gobbling" cheeseburger slide with a very realistic cheeseburger with 2 white molded eyes on top. When a figure is on the round blue platform/lever in front of the burger, and the lever is pushed down, the burger opens and the figure flies into the burger's mouth. The base also has a white McDonald's® cup with an attached lid and 2 eyes on top. The lid has a small round white "straw" on top. An Original Little People figure can fit on the "straw" and ride as the "Milk Shake Shaker" wobbles around. FPT629 - Blue top, white base 2-seat car (front-to-back seats) with slightly raised "fins" on both sides of the back seat. The car has a gas hole on the back corner, has a tow hook hole under the front bumper, and is marked "Marked "©1969-1987 FISHER-PRICE" on the bottom of the car. The car rolls on 4 black smooth rolling wheels with metal axles. The wheels are NOT marked. *See "Variations" below. FPT1204 - Red 1-seat french fry coaster with yellow "french fries" on all four sides. The coaster rolls on 4 small black wheels. FPT1208 - Brown plastic upright restaurant style trash can with a rectangular opening on the top of one side to drop "trash" into. The trash can is enclosed on the top and sides. FPT222 - Yellow McDonald's® "golden arches" sign with a red lithograph on both sides marked "McDonald's®" in white. The sign has a short post (3" long) with a square base on the end. JAPP - Ronald McDonald with a yellow body, red and white striped arms, yellow gloves, and red hair. IYPP - Hamburgler with a white body, black and white striped arms, red gloves and tie, a big rim black hat, and black mask over his eyes. GGPP - Light red mom with fancy eyes and blonde bun. *See "Variations" below. EYPP - Yellow boy with black molded plastic hair. *See "Variations" below. FXPP - Orange girl with a light brown sculpted bob. FPT655 - Yellow top, white base 2-seat car (front-to-back seats) with slightly raised "fins" on both sides of the back seat. The car has a gas hole on the back corner, has a tow hook hole under the front bumper, and is marked "©1969-1987 FISHER-PRICE" on the bottom of the car. The car rolls on 4 black smooth rolling wheels with metal axles. The wheels are NOT marked "Fisher-Price Toys". FPT4524 - White top, blue base 2-seat car (front-to-back seats) with slightly raised "fins" on both sides of the back seat. The car has a gas hole on the back corner, has a tow hook hole under the front bumper, and is marked "©1969-1987 FISHER-PRICE" on the bottom of the car. The car rolls on 4 black smooth rolling wheels with metal axles. The wheels are NOT marked. GOPP - The red mom could also have a dark red body opposed to light red. CIPP - The boy could also be green with black molded plastic hair. EZPP - The boy could also be yellow with brown molded plastic hair. Sold in a 20-1/2" long, 16-1/8" high, 9" deep box. Also see 1991's Chunky Little People #2552 McDonald's Restaurant.